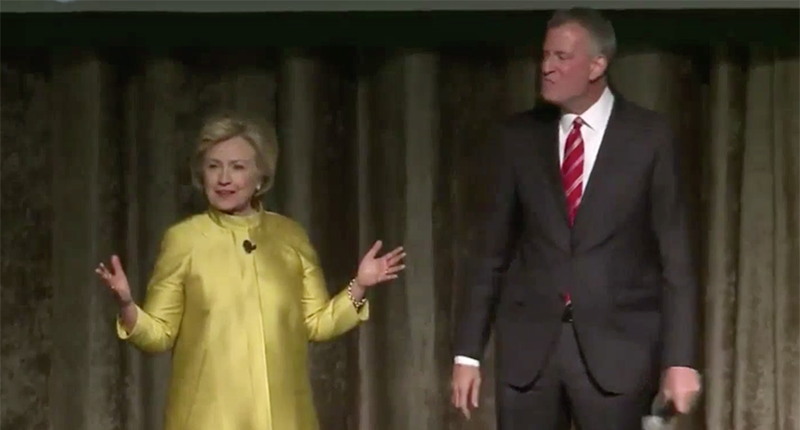 In less than three minutes, a comedy routine between Hillary Clinton and Mayor Bill de Blasio of New York managed to cause a storm of controversy over a racially charged joke. “Sorry, Hillary,” Mr. de Blasio said. “I was running on C.P. time,” a reference to the stereotype “Colored People Time” that drew some cringes from the audience. Speaking on CNN on Monday evening, Mr. de Blasio said that the exchange was part of a scripted event and that all parties were in on the joke, with “cautious politician” being the intended punchline. While Hillary Clinton was not very funny, Saturday Night Live did have a funny cold open skit at her expense (video above). The skit mocks both her losing streak in the recent primaries and her difficulties with the New York subway. The video of her actual attempt to get on the subway is included in the linked post.